another dumb question, when sleeping in a test that has a floor, how do you keep the cot legs from tearing thru the flooring? is this an issue at all? I bought a "military style" cot from Cabelas many years ago, but never really used it... until recently. Because of employment/economics, I've slept on this thing every other four days for the past 8 months. From the looks of it, it looks and weighs like the real thing, at least 15 lbs and sometimes a real bi*** to set up; I'm working to perfect my technique. It's still standing and the fabric always sets up tight. I use a self-inflating Thermarest on it, but it slips a bit. Lucky I've learned not to move too much when I sleep. My buddy and I have used a tent and cots for several years in the winter to hunt. Cots are the way to go with a nice thick bad under your sleeping bag. Luckily we had an expedition tent with a small wood stove. Quite pleasant for the wintertime. 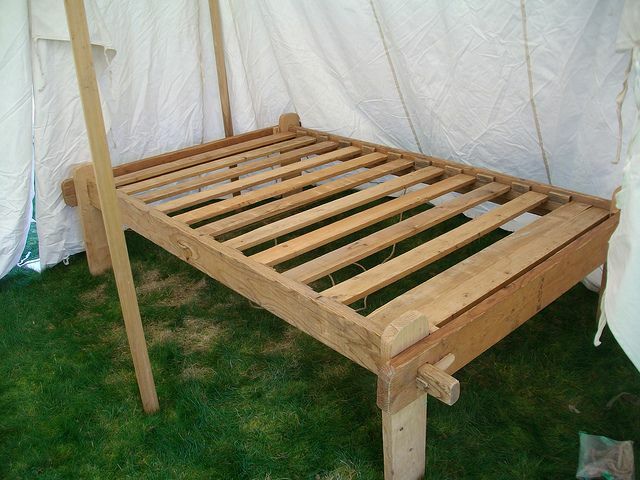 I also agree the bigger cots are more durable and comfy. I am a small guy and use a slumberjack and it is pretty hard which for me is good cause softer ones sink to much for me. I spent the night a friend extra wide and it was soft and consequently not very flat or comfortable. We are all different and like different things. I prefer a air mattress but have yet to find one that last for very long w/o developing a leak. Ditto on foam pads, you can also fold over foam mattress pads too. I just Bought & received (2) cheepies $ 26.98 from sportsman guide---made by (stansport)-steel leg cot--- A pain to put together,but I did it. NOT something I would want to do to many times---I bought them for visiting friends camping @ my place to get them off the cold ground. once together, decent item. right this minute My cat took over so I could type this. it's hers now. haha.. thanks. i'll look that up.. one human cot, 1 cat cot.. I make my 'cots'. I use scrap materials and some rope actually. It is a 15th century pattern (kinda sorta), but when I was at a museum I saw the very same type frame, but it used moosehide rawhide for the webbing from the 1860's in northern BC. You can also use slats, but I started using the rope bed style and I sleep very well on it. Make sure it is tight, bowing the sides in a bit to act as a spring, or you will sag in the middle of the night, which is not a huge bad thing, if you are by yourself.... . It took me about 30 minutes to make it out of four 1x4's, but you can make it out of thicker materials. Once laced together, you can drop out the three 'spreader bars' and wind it up on itself, so putting it back together is quick and easy. My first one was a double, but after that I started making twin beds. They are cheap enough, occasionally I will change out the wood, but I have kept the rope though 15 years worth of versions? I also did not 'dovetail' the corners. I used a jigsaw and a drill only for the project and usually the wood I get for free. This would be a really easy one too, but I think I would make the slats on two strips of cloth, so you can just roll it out and they won't go wonky on you. Also easily made, and on the cheap. Both these beds pack down to nothing. I just knew everyone was giving me a bad time for taking a bed to an event once, but after the monsoon that happened, I think I had the only dry bed in camp. Plus, I made mine tall enough I could slip coolers and other things underneath. But you can make it anywhere from inches above the ground, to I think mine were just about an inch above the height of a normal large cooler. 24" or something like that. I can't speak highly enough of the ExPed downmats. They aren't like your normal camping pads. They're plush, comfortable, and much more packable than a cot. They're not cheap, but they are fantastic. REI garage sale. I missed their flagship model cot that was discounted $100 by mere seconds. As long as the tent is big enough to fit the cot without touching the walls I think the cot is one of the best choices out there. I just knew everyone was giving me a bad time for taking a bed to an event once, but after the monsoon that happened, I think I had the only dry bed in camp. That is the general problem with tents. Even if your bed is dry, if the ground is wet then it would be no fun. Some kind of tent platform is ideal, but such a thing is not very portable and good for some place permanent. I use my enclosed trailer for a shelter when I deer hunt. Previously I used an air mattress on the floor. This year my buddy went hunting with me and brought a Coleman Ridgeline III cot that he bought at a yardsale. I inflated my air mattress and discovered a hole in it. Upon his recommendation, I bought the Coleman cot. Very nice. Good sleep. I put some extra blankets on top of the "mattress" that comes with it, sleeping bag on top of that and it was better than the air mattress. The grandkids love the cot!!! We bought another, with some cheap kiddy sleeping bags, it's an adventure for them. They fold up and store well with my preps. Being lightweight, they will not take much abuse and I would never hike with them.